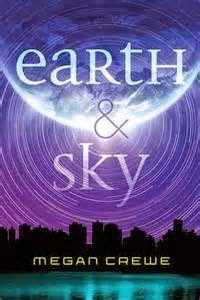 For this week's Timeslip Tuesday I offer Earth and Sky, by Megan Crewe (Skyscape, October 2014) --YA sci fi with a bit of romance and cool time travelling technology. Skyler has been troubled for most of her life by flashes of wrongness--but unlike premonitions, there's never any manifestation of disaster, just her own disorienting panic. Sklyer doubts her sanity....until she meets Win, a strange young man who tells her the reason for the wrongness. Earth is the subject of an alien experiment, one in which time travelers from another planet set and reset events as they choose, and it's these resettings that trigger Skyler's sense of that things are not right. And not only are Earth's people lab rats manipulated in time, but all the resetting is weakening the fabric of Earth's reality. Win is part of a rogue faction that wants to end the experimenting once and for all...and in Skyler, with her ability to see the shifts in reality, he thinks he has an edge over the enforcers trying to maintain the status quo of interfering change. Skyler is not unmoved by Win's need for her help in saving the earth....but as they journey through time to find the four parts of the mechanism that will destroy the time sphere around Earth (which were hidden in different eras by the leader of the rebels) she can't help but struggle with a perfectly reasonable feeling that she is being used. Win's people don't see humanity as their equal (though he himself is open-minded, there's still a bit of a learning curve there) and on top of that, it takes some time for Win to be fully open with Skyler about the rather complicated plot in which he is involved. But by the end of the book, she is no longer a means an end to him, and he is no longer a manipulative alien cypher to her, and so the set up for romance has been nicely established. So there is adventure, as Skyler and Win keep one step ahead of the enforcers, and tension between the two of them, and angst and fatigue on Skyler's part as she a. wonders if time travel can bring back her lost brother, b. wonders if Earth can be saved, c. wonders (a little--the romance angle is there, but not the main point) about her relationship with Win, and d. wonders if she will be killed by the enforcers before getting her (quite possible altered in fundamental ways by the mucking with time that's happing) life back. I appreciated the interesting premise--it plays up the paradoxes and consequences of time travel very nicely--and I enjoyed especially the gradual revelations by Win of his side of the story, but the book as a whole just didn't transcend "fine" for me. Skyler doesn't come across as the most deeply individual first-person narrator I've ever read, and the whole plot mechanism of hidden elements of a device that must be found by the good guys before the bad guys can stop them felt a tad contrived. I never really understood why it had to be so complicated, and I never really understood why the bad guys were still so set on keeping their experiment in place. I'm not sure they were getting much out of it. Interesting premise! Did you read Conrad's Fate? It's the last-written (I think?) of the Chrestomanci books by Diana Wynne Jones, and it has a similar notion to this, though handled very differently.